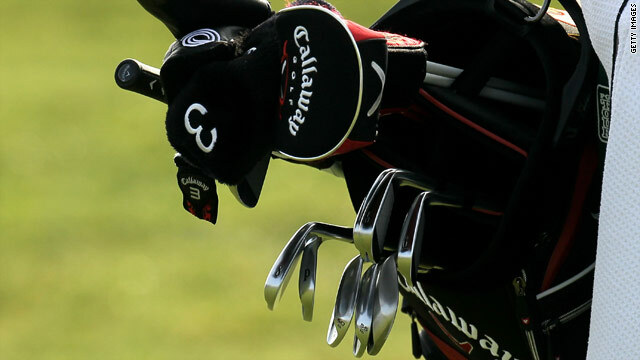 Mickelson's bag contains the controversial wedge which has sparked a major row. (CNN) -- An angry Phil Mickelson hinted at legal action for being accused of "cheating" by fellow PGA Tour professional Scott McCarron. The world number two carded a two-under 70 to be four shots behind third round leader Ryuji Imada at the Farmers Insurance Open, but for the second day in a row his post-round press conference centered on his use of a 20-year-old wedge with square grooves. McCarron was quoted in the San Francisco Chronicle on Friday, saying that Mickelson and others who had opted to play with the Ping-Eye 2 wedge were exploiting a loophole in PGA Tour rules. "It's cheating, and I'm appalled Phil has put it in play," he said. New rules introduced this year only allow for irons with V-shaped grooves, but because of a lawsuit filed by manufacturers Ping an exception has been made for wedges, with square grooves, which were made before April 1, 1990. Mickelson is using one of those wedges at Torrey Pines this week and on Friday he was grilled about his use and McCarron reported comments. Mickelson declined then to get into what he called "name calling" but mounted a stout defense of his use of the club, saying it was within the rules. But after his fine third round on the South Course, Mickelson appeared to up the ante. "We all have our opinions on the matter, but a line was crossed and I just was publicly slandered," Mickelson told the official PGA Tour Web site. "And because of that, I'll have to let other people handle that." Asked he was mounting a lawsuit, Mickelson said, "I'm not going into specifics what that meant." Meanwhile, the PGA Tour has issued a statement to explain why the controversial Ping-Eye 2 wedges were approved for play, appearing to criticize McCarron for his comments. "Because the use of pre-1990 Ping Eye 2 irons is permitted for play, public comments or criticisms characterizing their use as a violation of the Rules of Golf as promulgated by the USGA are inappropriate at best," read the final paragraph of the statement. Mickelson said that it was "cool if they put that out there." On the course, Imada shot a two-under 70 for a 13-under 203 and had a two-shot lead over Ben Crane (69) and Michael Sim of Australia. U.S. Open champion Lucas Glover carded a 68 and was three shots behind with Mickelson a further stroke behind on his season-debut on the PGA Tour.